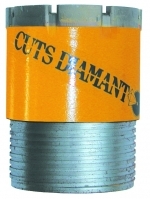 Diamond core bits complete range of core bits for dry and wet coring that can be used for drilling concrete, reinforced concrete, masonry and bricks. Seller Diamond core bits acording to the different models, they are available from the diameter 12mm until 1000mm and from the length 150mm until 500mm. Complete range of diamond core bit for dry and wet coring that can be used for drilling concrete, reinforced concrete, masonry and bricks. According to the different models, they are available from the diameter 12mm until 1000mm and from the length 150mm until 500mm. Diamond core bit with electroplated diamond for portable machines to drill ceramic, stoneware, marble, granite, bricks and stones. Diamond core bit for core drill machines for dry cutting. The core bits can be supplied both with segments with standard diamond or with positioned diamond. According to the model, they are available from the diameter 32mm up to 202mm and from the length 150mm until 320mm. Diamond core drill bit to be used on drill stands for wet drilling. The segments of the core bits are available both with standard diamond , as well as with positioned diamond which grants better coring performance, high cutting precision and long durability. According to the model, they can be supplied starting from the diameter 12mm until 1000mm and from the minimum length of 320mm until 500mm. Diamond core bit for continuous coring. This system permits to core up to the depth of 30 metres and it highly reduces the drilling time, since it is not necessary to remove each time the core from the tool. All product for core drill, diamond drill bit , diamond core drill bit, core drill bit, core bit, diamond core drill, diamond tip drill bit, diamond drilling, diamond blade , diamond hole saw, circular drill bit, concrete core drill, granite drill bit, concrete drill bit, glass drill bit, hilti core drill, diamond saw blades, concrete coring, porcelain drill bit, diamond tools, concrete drill, hole drill bit, coring machine. We offers diamond hole saw bits with M14 for grinder for dry drilling of ceramic tile, brick, granite, fired, porcelain, marble and klincher. For optimum performance with diamond hole saws, you need to start drilling at an angle slightly tilted . After the initial phase the diamond cutter is brought gradually into a vertical position. When drilling is recommended performing light circular movements to facilitate a fast work progress. Founded in 1983 Parma Italy, We are an international leader in the production of diamond blades, diamond core bit , floor saws and masonry saws for building applications . The target of the company has always been since the beginning that of producing high quality diamond tools and to constantly renew its own range of items, in order to be always one step ahead of competitors in terms of quality and technology . The experience, the commitment and the great engagement of the Cuts Diamant team have enabled this company to grow year after year and to transform itself from a small handicraft firm into a well-established and solid enterprise, which is largely known and appreciated both at a national and at international basis. 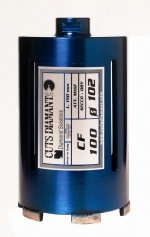 The trade organization of Cuts Diamant covers the whole Italian country through sales representatives and local dealers, whereas abroad it is present in more than 40 countries through direct importers. Diamond core bit for core drill machines for dry cutting. The core bits can be supplied both with segments with standard diamond. Diamond core drill bit to be used on drill stands for wet drilling. The segments of the core bits are available both with standard diamond. Diamond core bit for continuous coring. 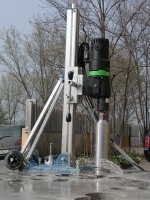 This system permits to core up to the depth of 30 metres and it highly reduces the drilling time. Cuts Diamant is the official dealer of the famous brand Stihl , international leader since 1926 in the production of high quality cutting machines.